The Village of Elk Rapids sits on both the East Arm of Grand Traverse Bay of Lake Michigan and inland Elk Lake. It’s the place to live if you love the water! 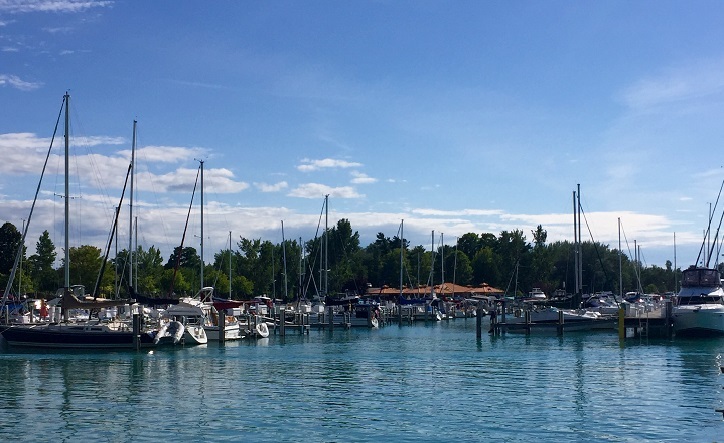 An expansive, in-town park sits on East Bay adjacent to the Elk Rapids Marina. Tired of swimming, kayaking, paddleboarding, jetskiing, and boating in the bay? Tennis courts, basketball hoops, a volley ball net, children’s play structures and swings, picnic tables and lots of space are sure to make everyone in your crowd happy! Plus there’s a fun little river along which you may float out into East Bay. Need a new beach read? The Elk Rapids public library sits just up the hill from the beach. Fun local stores in quaint downtown Elk Rapids are perfect for finding Northern Michigan art for your home, a beautiful piece of jewelry, and your holiday gifts. Elk Rapids’ area homes might include waterfront or water views, orchard or countryside views, or downtown village living. Additionally, there are waterfront condominiums close to downtown on both East Bay and Elk Lake. As Elk Rapids is just a short drive northeast of Traverse City, many residents work in Traverse City.